For the second straight week, the Crystal Ball is moving a toss-up Senate race to the Republican column. Now that ex-Gov. Tommy Thompson has captured the Republican nomination in Wisconsin -- winning with 34% of the vote in a crowded, four-way field -- we are installing him as a slight favorite to capture the Senate seat now held by the retiring Sen. Herb Kohl (D). The Wisconsin Senate race now leans Republican. Thompson, a former four-term governor of the Badger State and Health and Human Services secretary under George W. Bush, was seen as the moderate in the race, a status that almost proved to be his undoing in the primary. As National Journal's Kevin Brennan pointed out last night 1, the difference between Thompson and another establishment Senate candidate, Lt. Gov. David Dewhurst in Texas, is the fact that there is no runoff in Wisconsin. If there were, Thompson would probably be doomed: 66% of the primary vote went to other candidates. But Thompson survived, and his more moderate profile is probably good for the general, where he will face Rep. Tammy Baldwin (D), a relatively liberal congresswoman. That's not to say that Thompson is a sure thing to win the seat, but he has to start off as the favorite. In the lead-up to the primary, Thompson looked as though he might be a goner, but the top poll in Wisconsin -- the Marquette University Law School Poll 2 -- stuck with Thompson as a favorite. That poll didn't nail the margin like it did in the Wisconsin recall 3, but it did pick the winner. As Wisconsin remains in the spotlight both as a potentially decisive state in the Senate, and as a borderline swing state in the presidential race, that's the poll to watch. The Thompson rating change gives Republicans six seats rated as leans Republican: Arizona, Indiana, Missouri, Nevada, North Dakota and Wisconsin. Of these, North Dakota seems likeliest to move into toss-up territory eventually, which seems counter-intuitive because the Peace Garden State probably will give Mitt Romney a greater percentage of its presidential votes than any of these other states. But Rep. Rick Berg (R) seems like a fairly weak candidate, and ex-Attorney General Heidi Heitkamp (D) is proving to be unexpectedly competitive in the race to replace the retiring Sen. Kent Conrad (D). Arizona seems like the most Republican of these states, but even there Democrats appear to have a chance; Democrats have better opportunities in the other four, but they are underdogs in all. Assuming that all six of these tenuous leaning Republican seats hold -- and the leaning Democratic Senate races in Hawaii, New Mexico and Ohio also stay Blue -- the Republicans would have a 49-47 Senate edge, with four remaining toss-ups. Democrats would need to sweep all four toss-ups to retain a bare majority in the Senate, 51-49. The toss-ups are Florida, Massachusetts, Montana and Virginia. For the Democrats, Florida is the easiest to retain; Sen. Bill Nelson (D) appears to have an early edge on Rep. Connie Mack (R), who was officially nominated on Tuesday night in the Republican primary. In Massachusetts, the Obama tide might sweep away Sen. Scott Brown (R), and in Montana, a Romney tide might do the same to Sen. Jon Tester (D). Virginia is a pure toss-up. We are not changing any of our House ratings as a result of Tuesday night's primary results in Connecticut, Florida, Minnesota and Wisconsin, which is probably a good thing for Democrats. The most important result of the night was the victory by ex-state Rep. Elizabeth Esty in Connecticut's Fifth District Democratic primary. State House Speaker Chris Donovan was a heavy favorite to win both the primary and the general election until a campaign finance scandal rocked his campaign a few months ago 4. Republicans would have loved to run against the damaged Donovan, and had he won, this race might be in toss-up territory, but Esty's victory stabilizes things for Democrats in this potentially swingy seat on the New York border. The rating remains leans Democratic, although Republican nominee state Sen. Andrew Roraback (R) won't be a pushover. Ex-Rep. Alan Grayson (D-FL) -- think of him as the Democratic version of Rep. Allen West (R-FL) -- ran ads against one of the Republican primary candidates, Osceola County Commissioner John Quiñones, which might have helped another candidate, attorney Todd Long, win the Republican nomination. Quiñones was the preferred Republican challenger in this new district that President Obama won with 60% of the vote; as it stands, we're keeping this race as leans Democratic; Grayson might be able to kick it away, but he got the primary result he and national Democrats wanted. Republicans also got some good news in Florida, where Rep. Steve Southerland (R) will face the more liberal ex-state Sen. Al Lawson (D) in the Republican's panhandle district, rather than the more conservative state Rep. Leonard Bembry (D) -- this race stays likely Republican, and it's closer to the safe column. Meanwhile, in southern Florida, Joe Garcia (D) will get another shot at Rep. David Rivera (R), who is under the cloud of ethics questions 5. That race stays leans Republican. In other races, ex-Rep. Rick Nolan (D) -- really, really “ex-Rep.” because his last year in the House was 1980 -- captured the Democratic nomination in the toss-up Minnesota Eighth District, where freshman Rep. Chip Cravaack (R) is a big Democratic target. Nolan, who was endorsed by the party, has not shown himself to be a strong fundraiser, but national money on both sides should flow into this district. Notably, Bill Clinton's preferred candidate -- former Michele Bachmann challenger Tarryl Clark -- lost this race; so did another Clinton-backed candidate, businessman Dan Roberti, in the CT-5 race. Clinton also endorsed ex-Rep. Ciro Rodriguez in a runoff a few weeks ago for a House seat in Texas; Rodriguez lost to state Rep. Pete Gallego. The Big Dog isn't always a kingmaker. Tuesday night was the last big primary day before November, although there are a few primaries still to be decided, as shown in Chart 1. 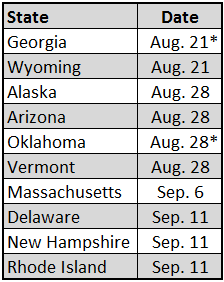 States to watch are Arizona on Aug. 28 (where there are some competitive House primaries); New Hampshire on Sept. 11 (gubernatorial primaries on both sides); and Rhode Island on Sept. 11 (embattled Democratic Rep. David Cicilline will try to hold on in his primary). Notes: * indicates runoff from earlier primary.